Marvin Jensen was a cook in the 70th Tank Battalion during World War II, and he has written a interesting and riveting account of the 70th exploits during “The Big One. 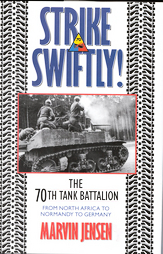 The 70th was an independent tank battalion that was attached to different Infantry Division during the war. Jensen’s story begins when the Battalion was formed in the United States in June 1940, at the same time as the 1st and 2nd Armored Divisions, partially in response to the Germans lighting conquest of France. After training in the states, the 70th was split and up and shipped overseas. Part of the battalion went to Iceland for garrison duty, the other portion headed to North Africa to be part of Operation Torch. Jensen uses first person narratives from veterans of the 70th, which I really enjoyed, making this a very personal story and bringing you closer to the action. The 70th – and their Stuart tanks – were attached to the Free-French forces in North Africa, and part of their group accepted the surrender of almost 10,000 German soldiers in Tunisia. After North Africa, it was on to Sicily and the hard fighting there. The battalion also traded up most of their Stuarts for Shermans, and Jensen goes into detail about the soldiers feelings about the US Army’s mainstay during the war. Once Sicily was secured, the 70th was reunited in England with the garrison troops in Iceland, and prepared for the invasion of Europe. 70th tankers hit the beach as part of the first assault wave at Utah Beach, and then participated in the savage hedgerow fighting that took place in the weeks after the invasion. The 70th operated mostly with the 4th Infantry division in this part of the campaign, and established such a reputation for themselves that they were at the spearhead of many operations, such as the breakout from St. Lo, the defense of Mortain that saved the breakout, and the famous dash across France. Once the fall of ’44 came, the 70th ended up in the bloody quagmire known as the Hurtegen Forest. After surviving the Hurtegen and getting ready for R & R in Luxembourg, the Battle of Bulge broke out, and once again the 70th was thrown into the fray. One of the tragedies of the European conflict was how soldiers had to fight for the same ground on the Belgium/France/Luxembourg/German borders twice. The 70th was no different, fighting their way across the Siegfried line and into Germany two different times. The end of the war found the 70th deep in Southern Germany near Munich. They had fought in 8 major campaigns, received numerous commendations, and were in the front lines from North Africa to the Nazi surrender in 1945. I found STRIKE SWIFTLY an interesting and informative read. It gave a good perspective of the tankers war, (For a good view of the infantryman’s war, read “Citizen Soldiers” by Stephen Ambrose) with some insight into how General Patton almost singlehandley delayed production of the M26 Pershing, which most tankers were literally dying for. If you have a keen interest in World War 2, and in the European Campaigns and the tankers war in particular, I highly recommend this book.